Galley Wench Tales: Kill Them. Kill Them All. Thus spake Dustin Hoffman as the big bad guy pirate in “Hook,” about Peter (Robin Williams) and the lost boys. In one of my least zen moments of this journey, I too ordered it, laughing evilly and unrepentantly about my desired fate for Culicoides, also known as no see ums or biting midges. “Blood sucking little bastards is what they are,” when Wayne said when he saw the Wikipedia image on my laptop. A small sampling of my no see um bites, before they swelled up. Clouds of these tiny demons infiltrated our boat in Cape Canaveral’s Harbortown Marina. Florida is a mecca for these nasty little critters, boasting 47 varieties, according to University of Florida, Entomology and Nematology Department. They’re small enough to easily wiggle through mosquito screen netting. After a miserable night of hundreds and hundreds of bites from these bloodthirsty little devils, we left. Madly itching welts covered us. 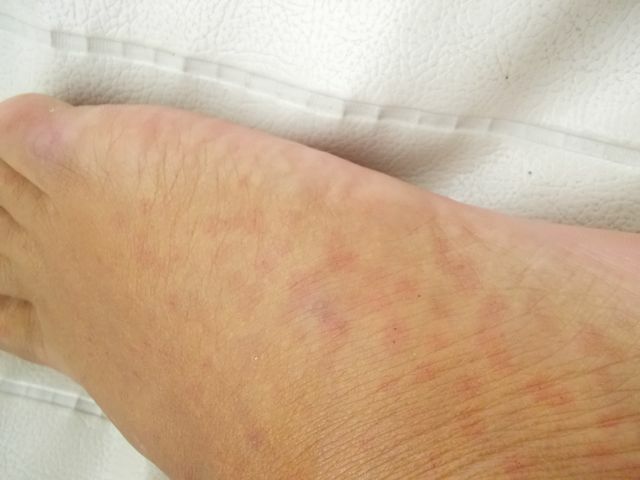 “Their bites can cause intensely itchy, red welts that can persist for more than a week,” informs Wikipedia. Great. provided proof that my revenge was successful. We hotfooted – as much as you can call sailing at 5 knots hotfooting -- to Titusville, to settle in an anchorage not moored in mangroves. 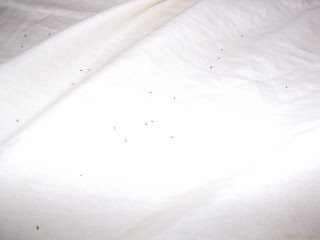 Problem was, the midges happily hitchhiked along; their tiny blood-filled bodies continued to torment us. We hit up the local drug store for Benedryl-like antihistimines to reduce the swelling and more hydrocortisone anti-itch cream. We also fogged the boat with Raid, keeping it closed up to kill as many of the wicked winged vampires as possible. 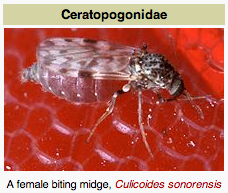 Unlike typical Twilight characters, fortunately, midges do die. There are but a few that survived the fogging. Their bodies leave bloodstains when we’re sharp-eyed and swift-handed enough to spot and successfully swat them. A fellow cruiser told us gin deters no see ums. Wayne tried it, and it didn’t work. I can’t quite get myself to deet up, like Wayne, so likely got a few more bites; my hands, neck and feet fared the worst. If we encounter clouds of these nasty insects again, I will, deet up, but not for a few stragglers. What’s the attraction to bloodsuckers? If I were Bella in Twilight, Edward would be spurned for Jacob. Give me justice, not bloodlust. Rumor has it, “Hook’s” “Kill them all!” line was uttered because Peter alone was not a sufficiently worthy opponent. Neither are the midges, I suppose. While not a fan of chemical warfare, the same arsenal also attacks mosquitos and “mahogany birds.” Bring on the bottle, and I don’t mean the gin. Please consider offering your input on Galley Wench Tales blog site. Click here to link to the survey. And, thank you for helping make Galley Wench Tales a better blog. Note: I promise the next posts will be more upbeat than the last few. Thanks, Ken. You are not the first person we've heard about Avon's Skin So Soft from as a bug repellant. I'm all for trying something less nasty than deet on my skin, at least that way if it doesn't work, then it's a nice moisturizer anyway. This incident inspired us to look into, set up and be diligent about using fine screens when in the territory. Thanks for all your tips and the heads up about Honduras. Hello,I did your survey yesterday without fully navigating your site. So please disregard some of the suggestions I made since, as I see now, You are already doing an even better website than I realized. Anyway to get on to my comment about your story,I was amazed when you mentioned Harbortown Marina, I was probably there that day as I am often, I live about five minutes drive from Harbortown. My son-in-law works there with the yard crew and I have yet to ask him if he remembers you being there. There is a product I have had really good success with, it's a clip on mosquito repellant by "Off". It is battery powered (AAA batteries) and has a small noiseless fan it requires refills after twelve hours, but I have had no problems with any type of insect while wearing one of these on my belt. Any survey feedback is useful, so thank you for that. The people at Harbortown were incredibly nice, and I did realize the biting midges are not there all seasons. They just sure were when we were. Thanks for the Off! tip. Of course, it's where we landed work that really drove our locale. Harbortown might still be a great option if we have to fly elsewhere to work for several months and want to put our boat on the hard. And yes, it is a beautiful area, rich in wildlife beyond bugs;). My In-Laws Rock! Our Bahamian Crew.